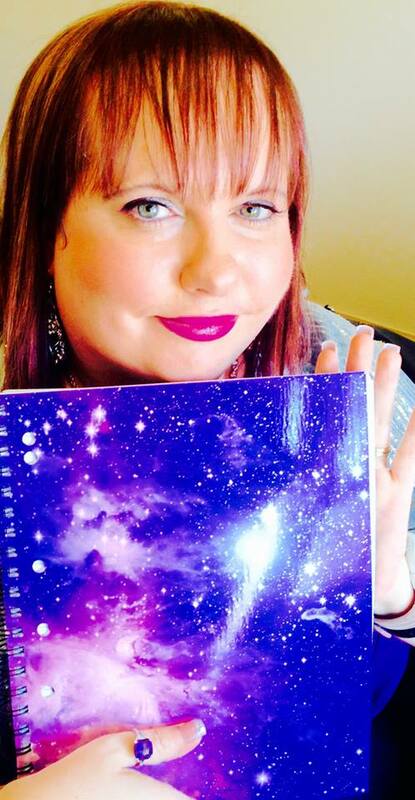 The new book of mine is called A Rising Moon on Domestic Violence, from the lovely people that have read it so far its been a positive and a wonderful uplifting experience. The words I have written in the book is raw and very real. By real I mean it is happening everywhere around the globe and I am the voice of advocacy. I tell you the stories in poetic form. It was very emotional to write, because lets face it, its a very emotional topic for many. One topic that should never be. Well I have a lot to update you all on, Last year in 2016 I co-authored several books, quite a few went to INTERNATIONAL BEST SELLER! Which I am extremely proud about. A lot has updated since then. I have released my book as I have mentioned earlier in this post. I am working on more books. I cannot wait to share with you all on whats coming next! A lot happened last year and I hope even more happens this year. The more people that spread the word around about me and what I do with my writing the better. I hope within myself to inspire many people. Never let anyone tell you that you cannot do what your heart desires. Show them that you can! ( Don’t forget to share!! ) 😀 !!! Sometimes in life you look over your own life in full. The good times, The bad bad times. Even the most heart aching and gut wrenching of times. Over the years of my life all I have ever wanted to do was share my writing with the world, how the words dance across the page, poetry in motion and written with devotion from a place deep within my heart. 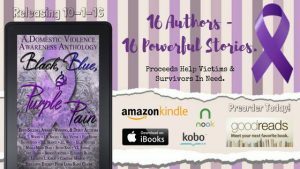 Earlier this year I was asked by a dear friend Laurie if I would like to write in a book called Black, Blue & Purple Pain A Domestic Violence Awareness Anthology, as she knew I was writing a book on that subject on my own, I jumped at the chance and said yes. I spoke to the compiler Angel L Woodz introducing myself, asking all kinds of questions that was responded in a way that made me feel included into such a book with a powerful message and it is. I am proud to say that I am a co-author of this book. The subject in nature that needs a spotlight on it, so many people go through it, they truly endure such pain, pain that should never be. So the men and women of this book came together and wrote such powerful pieces. I wrote from the heart, from a place in my inner mind. 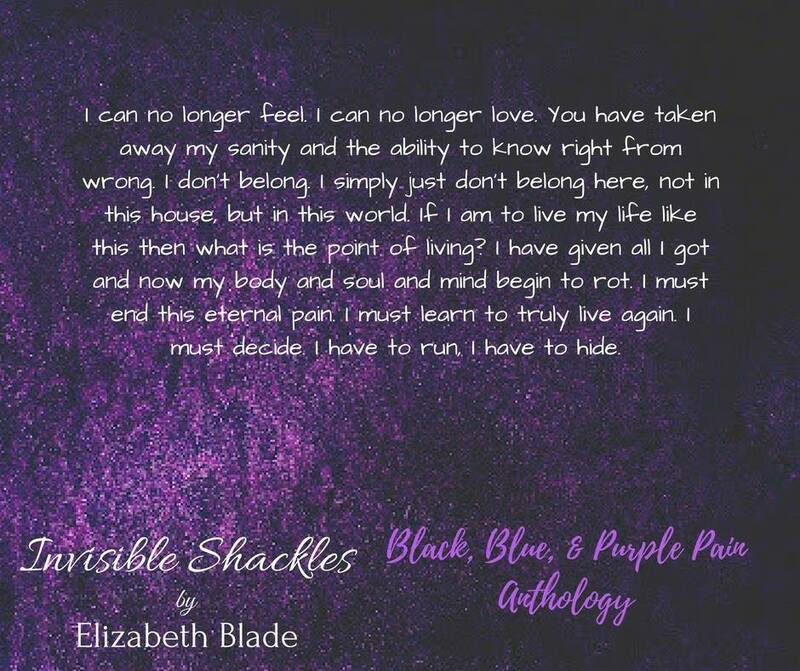 My piece in the book is called ‘Invisible Shackles’ It is a inspired piece, one I hope sends a message to all those that read it. I would like to give a special thanks to Angel for putting this book together and to all the other authors for making this book what it is. I would also like to give a special thanks to Laurie for letting me know about this book. To all that read it, please share it. 90% of the proceeds will be donated to help the victims of domestic violence throughout the sale month. Beginning November 1st, the regular price of $2.99 will be set and 100% of the proceeds from every quarterly sales of royalties totaling $100 or more will then be directly donated.